Further to my last blog post, "What Story Will You Choose", I wanted to share this compelling video from writer and artist Tamara Levitt entitled "Ode to Failure". In it, Tamara shares a personal story of how her preparation for success didn't prepare her for failure. Yet she goes on to show how "failure" has led her to a different story -- a story of transformation and celebration. Learn more about Tamara Levitt and her work at www.tamaralevitt.com. And, share your own stories of "failure" and celebrating effort in the comments section below. It was with great sadness that I learned of the death of Elsie Moir this year. Elsie passed away peacefully on March 24, 2017 after a struggle with cancer. She was 84. Elsie had fought off two previous bouts with the illness but had decided to forgo treatment when it returned a third time in favour of some quality of life in the time she had left. She was surrounded by her husband Ian and a very close and loving family. 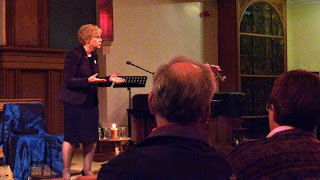 I met Elsie back at the beginning of 2011 when she signed up for one of my StoryCoaching groups in Edinburgh, Scotland. Elsie was 78 years old then, the oldest of our group. I remember her as a lively elder, full of wisdom, an indomitable spirit, and a twinkle in her eyes. We soon learned that Elsie was also a wonderful storyteller who could both entertain us with her original versions of children's tales and hold us spellbound with her accounts of her time working as a teacher in a black community in South Africa during the early 60s. The twelve years she and her minister husband Ian spent there in those years of apartheid deepened her commitment to social justice and active service to community. Upon her return to Edinburgh, Ian was subsequently assigned as minister to West Pilton's Old Kirk. Elsie returned to teaching, taking up a post at her old school in Edinburgh's working class district of Granton. But after a year, Elsie decided to devote her life to helping her husband and the Church's work in the communities of West Pilton and Granton which was seeing an influx of many new immigrant families. Elsie was determined to make them feel welcome. Elsie, a stalwart supporter of educational opportunities for all, turned her talents to the creative arts. She established a Parents and Toddlers group as well as one to support parents. 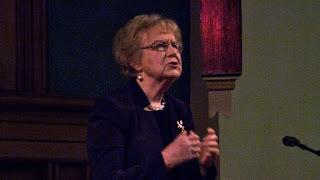 She encouraged the use of art, music, drama, and storytelling as she had done in South Africa. She also encouraged children and their parents to learn together inviting them to explore particular themes then present them as part of what was called the "Worship Workshops" to the entire community. During the 2000s, Elsie went on to set up the Magic Carpet Club and, later, the Patch Club -- again both aimed at supporting children and parents in using the expressive arts to share their stories. During this time, Elsie began to explore her talents as a storyteller to accompany her musical and craft skills. By all accounts her stories were loved and cherished. Elsie attended my StoryCoaching group for five years and in that time, we had the privilege of getting to know her well. She was an example of someone who did not let age (nor cancer) get in the way of her learning nor continuing to serve her community. She not only grew into a confident storyteller but also blessed the rest of us with her wisdom, honesty, and sense of humour. We often shared lunches or gathered in a nearby café where she would listen intently to another's story or share one of her memories of South Africa, a country and people she dearly loved. We never failed to be moved by her stories told without sentimentality. She had that knack of rooting historical fact in personal experience. You experienced events unfolding through her eyes and through the senses of those she knew first-hand. I'm sure I speak on behalf of everyone who worked alongside Elsie in that group that she was a very special woman. 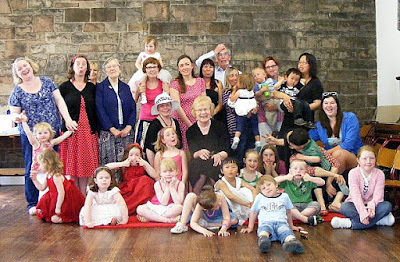 I remember a special storytelling performance ("The Gift of Story") we gave at Augustine United Church in Edinburgh during February 2013 and how Elsie enthralled the audience with her story of the children's uprising in Soweto in 1976. I'll always remember her final words, "The bringers of the light must endure the burning." Elsie's light shone bright and we endure the burning of her passing, yet I know her light will never be extinguished as long as we continue to remember her legacy and stories. I know I will for they are imprinted on my heart forever. Elsie is survived by her husband Ian, sons Andrew, Neil, and Peter, her sister Anne, and her eight loving grandchildren. Thank you to the North Edinburgh News for info and pics. 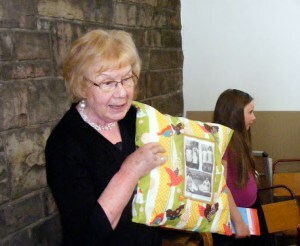 And many thanks to Ian for bringing Elsie to our StoryCoaching group during those five years. Such a blessing! Ever wonder why some businesses succeed where others fail? or why your own business isn't taking off the way you'd hoped. You've got a great service or product but you're not attracting the sort of clients you imagined working with? 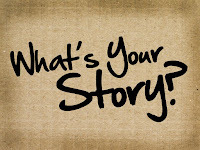 The problem might be your lack of a compelling story. One of the most important things I've learned from my work with business entrepreneurs, creatives, and artists is that the successful ones are ones with great stories. In fact, your story is probably the most valuable asset you have. Yet too many business focus more on telling people how great their services or products are. Having a great service or product is pretty much a given. But if you want people to really trust you and be willing to build a relationship with you, they need to know your story. That's why your website's "About Me" or bio page is probably the most clicked-on page -- people want to know who they're dealing with and why they should trust you. Your story can begin to build that relationship. I'm offering a 5-week course over at my Academy of Storytelling (http://academy-of-storytelling.teachable.com) entitled "5 Keys to Unlocking Your Story". In it, I offer 5 "keys" to helping you discover, shape, and tell your story -- a story which not only tells people who you are but shares your passion for what you do, your values and principles, and demonstrates that you understand your potential clients and are confident you can help them. I'm offering this course for only $79. It's a self-paced course. You'll receive the first lesson soon after you enrol and a new lesson each week. You can take as long as you want to complete it as the material is always available to you once you're joined the Academy and enrolled on the course. Each lesson has an audio introduction, content, and downloadable exercises to help you create, shape, and tell your compelling story. There's even a money-back guarantee. Go to the Academy of Storytelling now and enrol as a student for free. You only pay for the courses you enrol on. Once enrolled you can also join our Facebook "Common Room" where you can meet other students and share your experiences. And you can always contact me to discuss your work. Invest in your business today by signing up for the "5 Keys to Unlocking Your Story" and discover the treasure of your story. Take the first step toward attracting the sort of clients you want to work with. Start building relationships with your story and watch your business go from strength to strength as you become a storytelling entrepreneur. 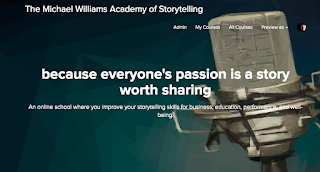 Sign up today for only $79 at the Academy of Storytelling. 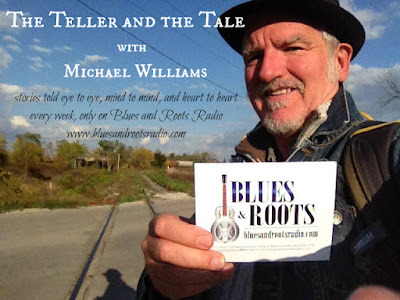 Storyteller Michael Williams tells the story of "A Winter Visitor", written by Joel Pierce for the "Ghostly Tales" competition, part of the Scottish International Storytelling Festival. The performance was held at the National Library of Scotland on 31 October 2016.